Chandler-Gilbert Community College (CGCC) is honored to host Dr. Andrew Needham, Associate Professor of History at New York University and author of “Power Lines: Phoenix and the Making of the Modern Southwest” for a discussion and book signing event as part of CGCC’s Native American Heritage Month activities. The event will be held this Wednesday, November 16 from 6:00 to 7:30 p.m. at the Pecos Campus Agave Room 1240. During the presentation, Dr. Needham will read excerpts from his book and participate in a Q&A session with attendees. 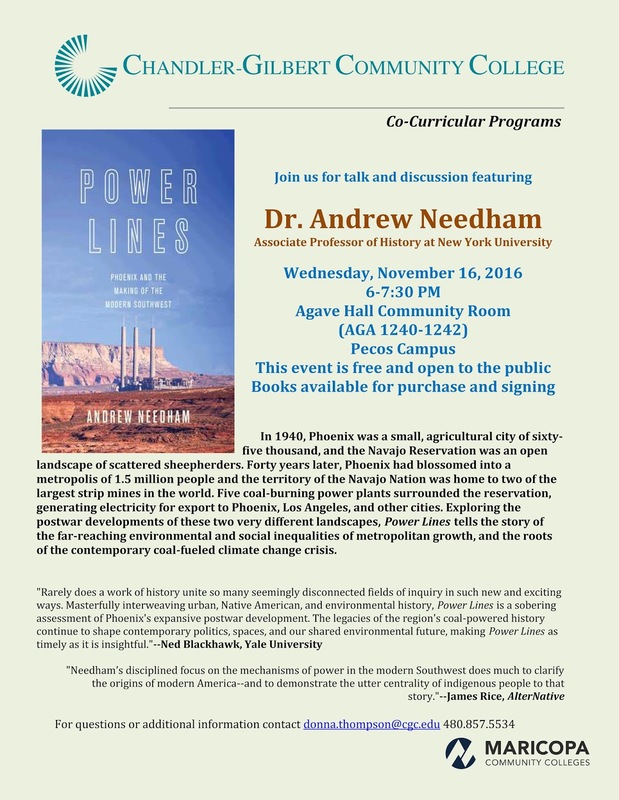 Dr. Needham’s book is based on the growth of Phoenix’s reliance on electricity and resources from the neighboring territory of the Navajo Nation. “Power Lines: Phoenix and the Making of the Modern Southwest” explores the often-untold story of Phoenix’s growth—a federally subsidized postwar boom that exploited the Navajo Nation and spurred the roots of the contemporary coal-fueled climate change crisis. This event is free and open to the public. Books will be available for purchase onsite.